I’ve created a dos virtual machine image a while ago; recently a colleague talked about it, so here it is for everyone to have a look at. It is a zipped archive (3.9M) that contains a vhd, vmc and vmcx file. You may have to manually edit the vmcx file, because it seems to contain absolute paths to the vhd. 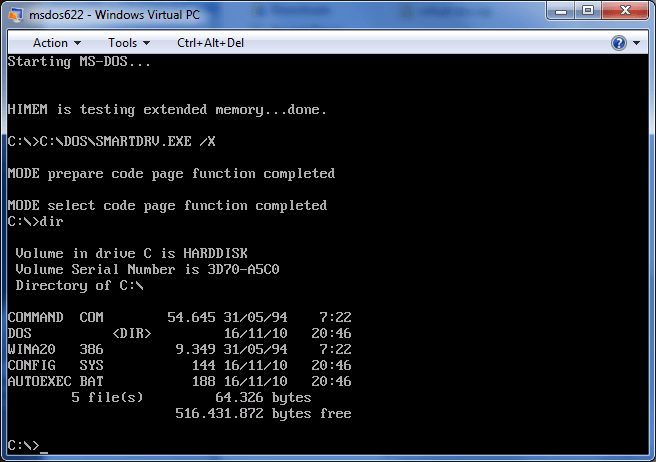 Make sure you have more than 500MB free hard disk to unzip. I like to use 7zip to handle the compression. To use this, you obviously need Virtual PC (free download from microsoft – you don’t need virtual xp in this case, just Windows Virtual Pc). You could put the virtual machine in “C:\Users\YOURNAME\Virtual Machines”, where you get some extra buttons in the menu bar of the explorer window to create and edit settings of the virtual pc images you might have.